It hits me hard as a police officer , what happened to you my brothers . Incredible! My sympathy goes to the bereaved! "I have laid down my life in service to all of you. You guard the gate now and I will continue my watch from above." MAY YOU REST IN PEACE AND MAY YOUR FAMILY FIND COMFORT IN THE GOOD YOU HAVE DONE HERE ON EARTH. THANK YOU FOR YOUR SERVICE TO US ALL. Doug Gist, Captain (ret) Washoe SO, NV. RIP brother. Thoughts and prayers are with your family, friends and your NYPD family. Watch over us as we continue the shift. 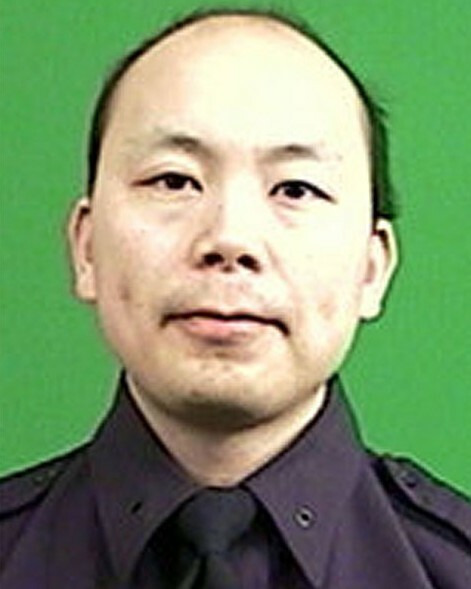 I am so sorry for the loss of Officer Liu. He will be missed, and he will not be forgotten. family member and friend of LEO's. All my thoughts are for the families of the victims. I hope you will find the courage and strenght to go througt that terrible event. You gave all to protect even the dirtbag that took your life. Thank you and all your brothers and sisters that wear the badge. My prayers are with your family and your fellow officers. GOD BLESS AND R.I.P. Thank you for your service, Rest in Peace, and may your family, friends and co-workers know you will never be forgotten! To the family, May you find peace in the days to follow....Reach out to your N.Y.C.P.D. family. You are in my prayers. TO THE FAMILY, FRIENDS AND COLLEAGUES OF NEW YORK CITY POLICE DEPARTMENT, POLICE OFFICER WENJIAN LIU. My heart is filled with great sadness at learning of the lost of your loved one and fellow Officer. We in the Law Enforcement Community are a family, though we may wear different uniforms and have different badges, shields or stars pinned upon our chest. Municipal Police Officers, Sheriff's Deputies, State Police Investigators, State Highway Patrol Troopers, Conservation Officers, Correctional Officers and Federal Agents just to name a few. We patrol small towns, large cities, county roads, state highways, state parks and the United States Borders. Whether active duty or retired, we are one family, a Law Enforcement Family, brothers and sisters bonded together by HONOR, SERVICE and PRIDE. You sacrificed your life in the service to the citizens of New York City in the State of New York with HONOR, PRIDE and DISTINCTION. New York City Police Department, Police Officer Wenjian Liu having served the citizens of New York City in the State of New York with HONOR, PRIDE and DISTINCTION IS NOW 10-42. Rest IN Peace my fallen Brother, YOU WILL NEVER BE FORGOTTEN!! RIP Brother, the Thin Blue Line has gotten a little thinner today. Know that those of us in Blue have your back, and will watch over your family. Although, it seems our nation is divided they are a small minority. The majority knows what we all do and the sacrifices we have given up for them. Rest easy my brother, we will take it from here. May God wrap his arms around you and your family. R.I.P brother. My heart is broken. Thank you sir. Rest in peace. You will not be forgotten. It’s about the bond that all service members share. This poem has been accepted by International War Veterans’ Poetry Archives. May God bless both family's and also the entire. NYPD you all sacrifice so much to protect total strangers. Our hearts go out to you in New York. These Heroes were doing nothing wrong except their jobs. These mindless killings have got to stop. My father was in Law Enforcement for 17 years and a Judge for 7 yrs. I have had friends Wounded and Killed in service to our public. I know you loss. May God help with your healing in this. You are in the prayers of many people and We Do Care!! We need to support our Officers and not the criminals in this country. GOD bless you and yours. Again my deepest regrets. We are so sorry for the violence that took your life. We are praying for your family as they grieve. We support all officers and first responders. Rest in peace sir.